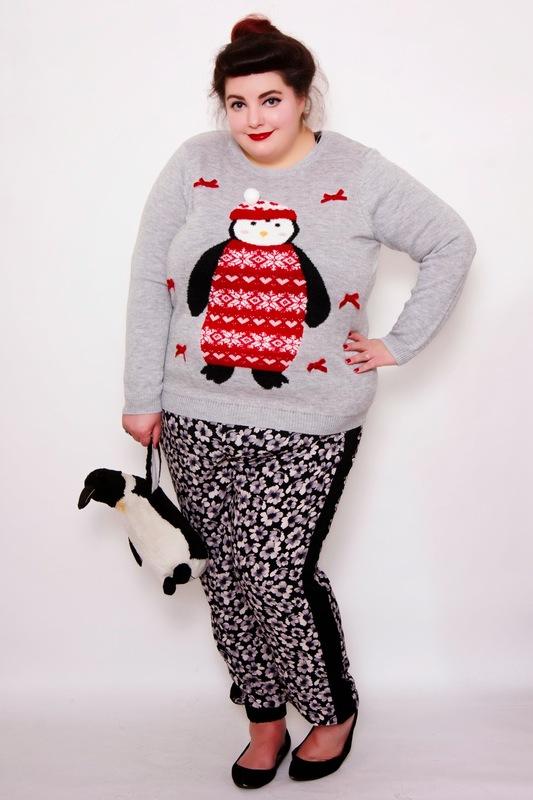 As today is the 1st November, it is officially acceptable to wear Christmas jumpers! Woohooo! As someone who works from home quite frequently, I am fully intending to live in this penguin delight from F&F True at least until next February! Their range of Christmas jumpers are available up to a UK size 28, and in addition to the penguin, feature reindeer, Christmas trees and snowmen. Whether you're wearing it for Christmas dinner or looking for something to lounge around in, who can possibly resist such kitsch filled cuteness? For maximum cosiness, I teamed my penguin jumper with the F&F True Floral Print Trousers. After all, who doesn't love a pair of pretty trousers which feel like pyjamas? I'll be doing a proper post about them soon as for something so casual, they smarten up brilliantly! I am so excited now that there's a proper chill in the air. It feels like Christmas is just over the hill, and I can hardly wait! These are amazing ... can't wait for Christmas jumper day at work to pull our my most shame-worthy knit and strut my stuff with christmas pudding earrings!